Ah, March 20th, the spring (or vernal) equinox. That means winter is over, spring is here, and all those daffodils blooming in my flowerbeds will be giving away to tulips, roses, and bluebells before too much longer. Since we’re looking forward to warmer weather, I thought I’d share a springtime dessert–one that was shared by my friend, Karrie. I haven’t made this but it looks totally yummy. 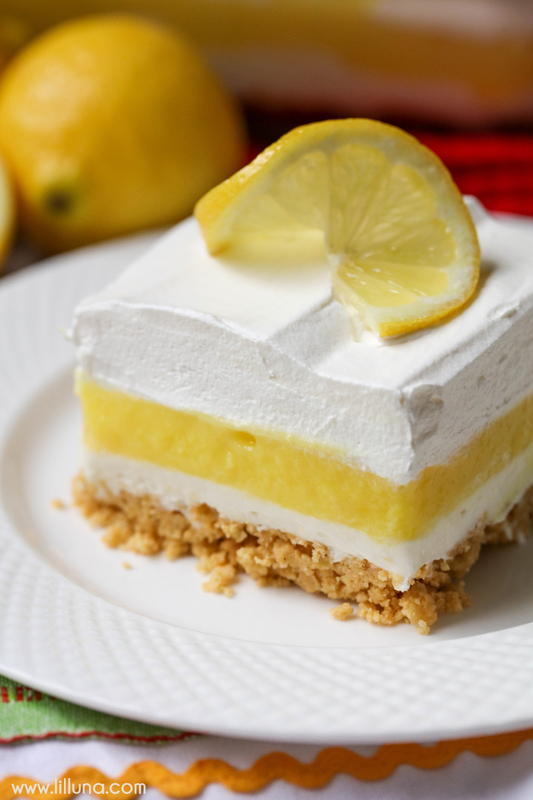 Lemon Lasagna – 4 layers of goodness including a Lemon Oreo crust, cream cheese layer, lemon pudding layer and topped with cream! It’s DELICIOUS! Press into the bottom of a 9×13 pan spreading out to cover the entire bottom of the pan. In a medium bowl, blend cream cheese, margarine/butter, powdered sugar and ½ of the cool whip. Blend well and pour over your Lemon Oreo Crust. Top off with the rest of your Cool Whip. Refrigerate at least 1 hour before serving. Add lemon slices and ENJOY! Karrie shared THIS WEBSITE where she found the recipe. Please go check it out for more pictures and a video of how to make it. This is one of those fancy desserts that looks like it was made by a dessert chef. That pretty much leaves all of my heroines out of the mix. But you know who makes it? One Dillon Tate, the youngest of the Tate brothers, musician extraordinaire and a man of surprising talents. Of course, his brothers are really going to rib him about this. Dillon doesn’t have a book yet but you can read about him in Deacon’s book, THE COWBOY’S CHRISTMAS PROPOSITION. This entry was posted in Writing Life and tagged books, characters, food, holiday, links, recipe, Red Dirt Royalty, Tuesday Treats. Bookmark the permalink. My daffodils are all leaves and no flowers. =o\ I guess I should be happy the deer haven’t eaten them yet. Cool, a recipe for one of your guys! Sounds yummy!